I've only ever watched the show Top Gear once. I'm not really well-versed with the ins and outs of the show and I couldn't really name you the hosts off the top of my head. However, with a simple Wikipedia search I can at least tell you that the show is currently hosted by Jeremy Clarkson, James May and Richard Hammond and that it deals with the latest innovations in motor-sports and production car driving. The latest trailer from RSI's marketing tank for Star Citizen takes the basic gist of the Top Gear show and then turns it on its head. For those of you unfamiliar with the show altogether, it's basically like a car version of “Fashion Police”. You get a detailed overview of the vehicle, you get to see it in action, you get to find out whether or not it's the sort of thing that's worth diving into for the price of entry. From what little I've seen it's actually a pretty awesome show, and if I had more time I would probably make it regular viewing. 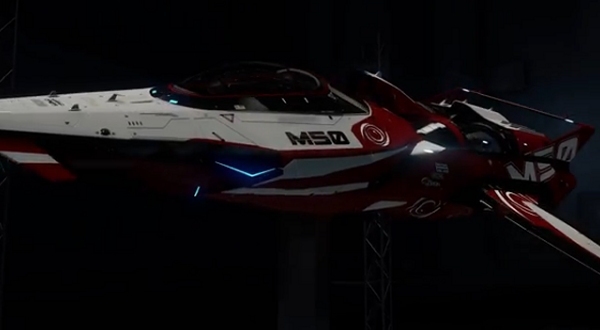 RSI an Cloud Imperium Games takes the core concept of Top Gear and shrinks it down to size for a three-and-a-half-minute trailer that does a fine job of providing an overview of the new and improved Origin M50. In fact, if you didn't actually watch the trailer and only listened to the voiceover, you might be convinced that it was actually a commercial for a new car of sorts. The trailer isn't just about spoofing a popular gearhead pastime, though. Everything you see in the video above is exactly how the game looks when you play it. That's right, that whole pitch was captured via in-engine capabilities. It really showcases the power of the CryEngine. What's most impressive is that there are incalculably dense details in just about every single nook, cranny and aspect of the ship designs. It just amazes me how rigidly exact some of those miniscule details really are; like the working gauges in the ship's cockpit, the paint trimming along the glass, or the working parts that move, shutter, shift and change based on the specific actions of the vessel. I have to say that just thinking about the amount of time it would take for artists to model those kind of intricacies into each and every ship seems terribly daunting and I'm not even working on the game. So far Star Citizen has done nothing but impress me. I doubt I have a rig that can play the game even decently, but it's coming along so nicely it feels like the sort of title that will create its own kind of meta-community, especially on video services like Twitch.tv and YouTube where you can sort of craft these organic gaming moments dictated by the player experience and not necessarily any kind of preset construct within the game. I keep getting the feeling that Star Citizen will sort of be like to EVE Online what Star Wars was to 2001: A Space Odyssey; throwing in plenty of nuance but with a strong flair for entertainment sitting at the center of the experience. You can learn more about the $50 million dollar independent title (and by all accounts, it is well into the consideration of being labeled an AAA title) by paying a visit to the game's official website. The dogfighting module has been the latest bit added to the game and I'm sure we'll hear more about the racing module soon.